Once upon a time, I was an actively developing themes and plugins for WordPress. No more. No, I have since moved on to other projects. And while this site is no longer updated, I want it to remain because when I was developing for WordPress, I found referencing other themes and plugins useful, even necessary. But with the inclusion of the three functions that were the heart and soul of the Sandbox now in the WordPress core, my mark has been made, and there are new directions to go. Those functions, sandbox_body_class(), sandbox_post_class(), and sandbox_comment_class(), can be found in your recent WordPress download, simply renamed as body_class(), post_class(), and comment_class(), respectively. Mission accomplished. So I hope what I did contribute once upon a time will continue to be of some use to the community. Plaintxt.org has become a single-page archive of what it was. Enjoy. Make yourself comfortable. Welcome to my personal experiment in combining minimalism with blog design. I offer themes that showcase your content and not my design skills, which are meager enough. Blogging shouldn’t be about filling a template. That’s how plaintxt.org came to be: a home for minimalism in blog design. The designs here are solutions to problems that I encountered. These are WordPress themes that addressed my needs and tastes. I hope you find them useful too. These themes include “premium” features, e.g., theme option menus that allow almost complete personalization as well as total Widgets compatibility, in addition to style sheets (including print styles) that demonstrate the highest attention to detail. 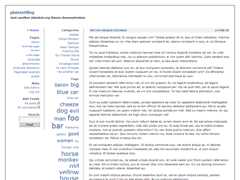 Each theme is free (as in speech) and licensed with the GNU General Public License , compatible with WordPress, a free semantic publishing platform, and include neither sponsored links nor deceitful code. Perhaps you were redirected here from sndbx.org. Well, back in 2007, I held a design competition for theme templates based on the Sandbox. This was the first such design competition in the WordPress community, and it went off without a hitch. Sponsors included Press Harbor, WordPress for Dummies , Matt, and others. Cash awards were given. It was awesome. Oddly, the most frequent request I have regarding the Sandbox Designs Competition is for the example content I provided so contestants could see exactly how their theme would look with the very content used in judging (the file, sndbx.2007-06-06.xml, is still available). If you are interested in any of the particulars of the Sandbox Designs Competition, I archive the sndbx.org content (now offline) in a PDF, Sandbox Designs Competition (Revision 5). Enjoy. These free themes are designed for use with WordPress, a free semantic publishing platform, and are licensed with the GNU General Public License . These themes contain no sponsored links or any malicious code, are Widgets compatible, and include theme options submenus. My favorite theme: Two columns with an unique approach to the fluid layout and typographically rich. An excellent choice for a photoblog, vlog, or any other content-centered blog. Features include customizable theme options from within the dashboard. An elastic layout that is minimal: Less than 300 lines of CSS for screen and print. 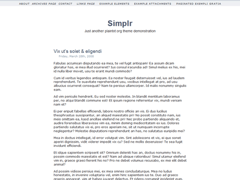 Robust theme options provide two- or three-column layouts for nine possible combinations. Named a top WordPress theme in Blogging for Dummies . A quintessential WordPress theme. 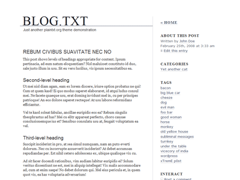 The original minimalist three-column theme for WordPress. Its uncluttered layout make it deal for customization, with a wide content area to ensure your content is what visitors notice, the theme itself transparent. Sidebars are intentionally narrow to discourage clutter. 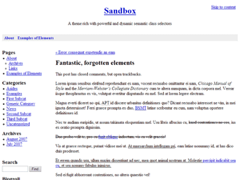 One of the most influential blog themes, the Sandbox is a starting point for designers and developers—the original and best blank slate theme. The Sandbox is rich with semantic classes powered by dynamic functions and Microformats. A collaboration between Scott (that’s me) and Andy. 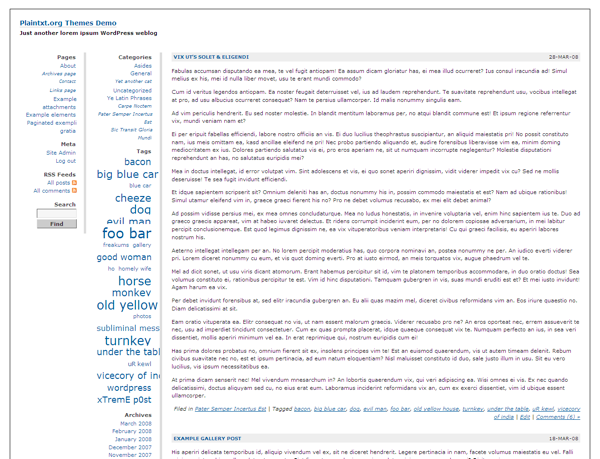 The original minimalist one-column theme for WordPress. It provides a unique format for highlighting the latest content. This is the theme I always wanted: one to reduce clutter and to provide focus. Features built-in recent comments and breadcrumb navigation. Excellent for photoblogs. 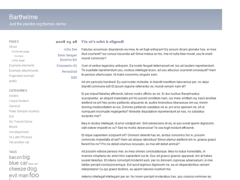 The original minimalist two-column theme for WordPress. A fluid layout with a newspaper-ish feel, its solid layout, thoughtful design elements, and numerous theme options make this theme much more than simply “plain.” This is the minimal classic WordPress theme. I have produced a number of plugins to modify and enhance WordPress to fit the needs I have required of it at times. In the spirit of sharing, I offer these plugins as experiments for general consumption, each licensed with the GNU General Public License . 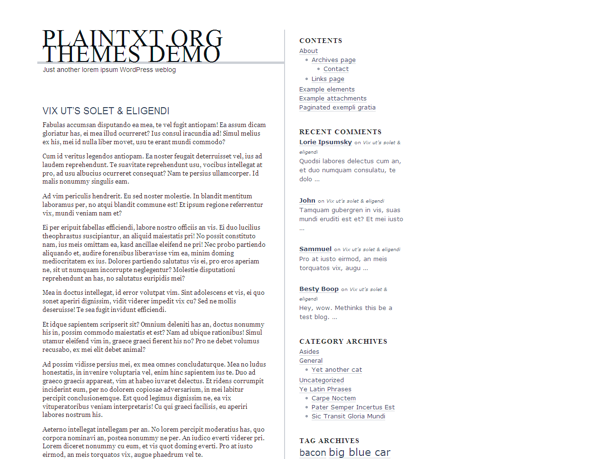 Blog Summary produces a semantic, hAtom-enabled list of latest blog entries with excerpts, dates, and comments links that is generated with the shortcode [blog-summary] on any post or page. Custom Field Widget displays values of custom field keys, allowing post- and page-specific meta sidebar content with limitless applications. Extended Options keeps meta data and certain WordPress tweaks persistent regardless of the active theme and without modifying any files. Maybe you have questions. And maybe I have answers. 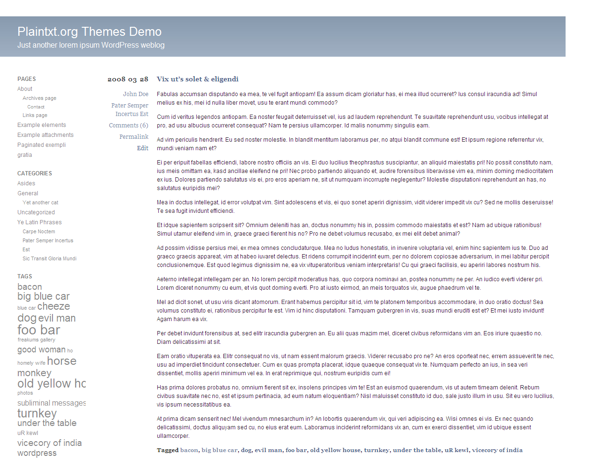 If you are interested in looking back at the development of these themes and plugins, then you are in luck. The experiments (i.e., plugins) are hosted in a Google Code repository called wp-plugin-dev. For themes, each has its own repository (see list below). You can also browse a folder here of downloads, too. If you have a question about any of the legacy WordPress software provided here, ask someone else. I no longer provide support. Sorry. However, the WordPress Support Forums are a great resource of information. Please go there. But if you really need to contact me for some non-support–related topic, you can do so via one of the sites mentioned below. As I mentioned, I am doing other things nowadays. You can find me on Twitter or perhaps my infrequently updated blog or, even better, check out some of my photography. You should have received a copy of the GNU General Public License along with this program; if not, write to the Free Software Foundation, Inc, 51 Franklin Street, Fifth Floor, Boston, MA 02110-1301, USA. All content is subject to change and is provided to you “as is” without any warranty of any kind, either expressed or implied, including, but not limited to, the implied warranties of merchantability, fitness for a particular purpose, or noninfringement. Please note that some jurisdictions may not allow the exclusion of implied warranties, so some of the above exclusions may not apply to you. Without limiting the foregoing, plaintxt.org neither warrants nor represents that your use of any Content will not infringe the rights of any third parties nor that the Content will be accurate, complete, or up-to-date. Additionally, with reference to any postings, comments, transmissions, and the like that may be on the Site, plaintxt.org assumes no responsibility or liability arising from any infringing, threatening, false, misleading, abusive, harassing, libelous, defamatory, vulgar, obscene, scandalous, inflammatory, pornographic, or profane material or any material that could constitute or encourage conduct that would be considered a criminal offense, give rise to civil liability, or otherwise violate any law, contained in any such locations on the Site. Your use of the Site is at your own risk. 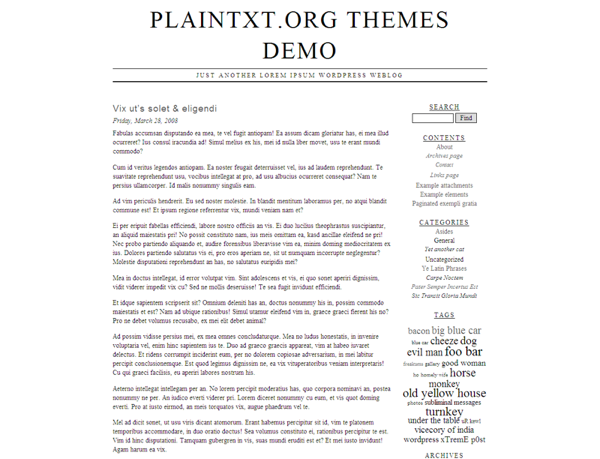 Neither plaintxt.org nor any of its sponsors, affiliates, participants, or visitors, nor any of its agents or any other party involved in creating, producing, or delivering the Site or its content, are liable for any direct, indirect, punitive, incidental, special, consequential, or other damages arising out of or in any way connected with the use of this Site or content, whether based on contract, tort, strict liability, or otherwise, even if advised of the possibility of such damages. Please note that some jurisdictions may not allow the exclusion of certain damages, so some of the above exclusions may not apply to you. 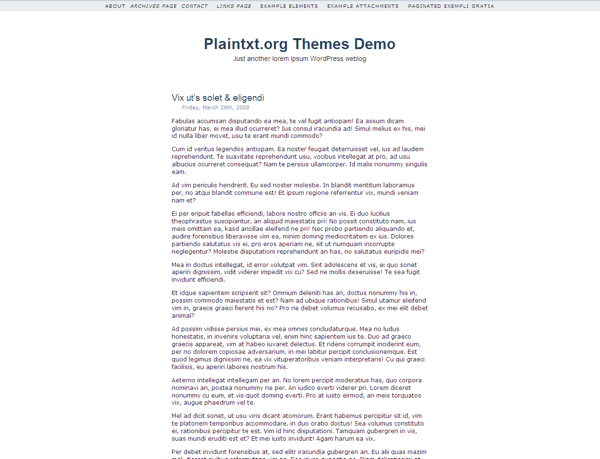 Neither does plaintxt.org endorse the content nor any products or services available on such Web sites. If you visit such Web sites or establish a hyperlink to such Web sites or the Site, you do so at your own risk and without the permission or endorsement of plaintxt.org. Any Content downloaded by you from this Web site, including, without limitation, any files, images incorporated in or generated by the software, and data accompanying the software (collectively referred to as the “Content”) are the sole property of the owner, Scott Allan Wallick, except as expressly licensed by the GNU General Public License , http://www.gnu.org/copyleft/gpl.html. Downloading the Content does not transfer title to the Content, or any intellectual property rights therein, to you. This Site contains copyrighted and licensed materials (collectively referred to as the “Content”) which are owned by plaintxt.org or its contributors. It is illegal to duplicate, download, or distribute any Content from this Site, except as expressly licensed and in accordance with the GNU General Public License , http://www.gnu.org/copyleft/gpl.html. You may not use photos or images of people or identifiable entities in any manner that suggests the endorsement or association of any product or service or in connection with any pornographic or immoral materials.